This post marks Part 12 of the 20-part series The Oscar 100. Join me as I reflect on the 100 greatest Oscar-nominated performances and what made them so richly deserving of recognition. Duvall portrays Bull Meechum, fighter pilot and the self-proclaimed "Great Santini." Bull's hostile demeanor and penchant for ruthless competition have worked wonders for him in the military but such behavior, which he cannot help but bring home with him, doesn't always go over so splendidly with the rest of the Meechum family. While wife Lillian (Blythe Danner) remains loyal and chooses to overlook Bull's flaws, his son Ben (Michael O'Keefe) is growing less hesitant to pushing back against his father's aggression. 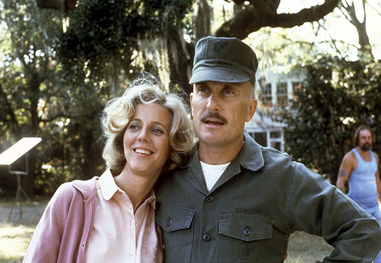 This performance marked Duvall's third Oscar nomination. By 1980, with 30 motion pictures and a pair of nominations under his belt, Duvall was already being looked upon as due for Oscar victory. Under different circumstances, triumph perhaps could have come to fruition for his tour de force turn in The Great Santini - that is, if 1) Warner Bros. and Orion Pictures hadn't so miserably botched the film's release and 2) he didn't have to face De Niro, a shoo-in for the prize in just about any year for his much-celebrated work in Raging Bull. As it stood, Duvall graced a film that barely expanded out of New York/Los Angeles and faced the most unstoppable of opponents. Duvall would go home with the golden statue three years later for Tender Mercies but, for my money at least, that performance, fine as it is, doesn't reach nearly the same heights as The Great Santini, the best vehicle of the actor's exemplary career. Bull Meechum is one mean S.O.B. - and he wouldn't have it any other way. His skills up in the air are undeniable but when it comes to succeeding on the ground, he's found instilling fear in his military colleagues and family is most advantageous. Bull is an impossible man with a nasty temper and penchant for hitting the bottle and, thus far at least, nothing has stopped him or inspired him to change his attitude. That is, until Ben, his kind and sensitive son, who has spent life suffocated by Bull's savage fathering, begins to fight back. In the film's most memorable and startling scene, Ben, a high school basketball superstar, at last beats Bull in a one-on-one game - this, after years of his father winning such battles by taunting, humiliating and whacking Ben with the ball. The look on Bull's face when Ben prevails could kill. Instead of congratulating his son or feeling any sense of pride, Bull instead becomes further hellbent on bringing Ben down a few notches, insulting him, getting plastered and later embarrassing himself at a high school game. Their fragile relationship is soon tested again when Ben intervenes to help his friend, an African-American who is being harassed by a racist bully. Once again, instead of supporting his son, Bull lashes out at Ben, incensed that he would place himself in such a situation. Bull's colleagues at work try to convince him otherwise but he just cannot get there - he'll perhaps never been able to understand his son's compassion, hard as he might try. These events culminate in Bull eventually emotionally collapsing and, the way Duvall portrays it, it's like watching a man who's never before cried in his life, someone who has been holding on to decades of suppressed emotion and at last, after all of this years, is letting it all out. For so much of The Great Santini, Duvall paints Bull as an unabashed monster, a man who gets a kick out of just how imposing and formidable he is and cannot see (or simply opts to overlook) how such behavior damages those around him. Yet, all along, there's also a sense that Danner's Lillian must have long ago seen something in this towering figure that she found appealing, something that convinced her Bull could be a family man. At last, we eventually do see Bull's humanity and vulnerability come to the surface. The real gut-punch is, just as there's suddenly a glimmer of hope on the horizon for him and his family, tragic fate intervenes. Duvall, Danner, O'Keefe and The Great Santini were overwhelmingly overshadowed in 1980 by the other masterful family drama of the year, Ordinary People. Nothing can top the Robert Redford picture for me but, that being said, The Great Santini and Duvall are sorely in need of rediscovery. This is an absorbing and expertly performed film that finds Duvall at the absolute top of his game. Holden portrays Joe Gillis, a floundering Hollywood screenwriter, deep in debt and contemplating a move back home to settle for an ordinary office job. One day, while on the run from men vying to repossess his car, he pulls into the driveway of a seemingly abandoned mansion on Sunset Boulevard. Lurking inside, however, is the once-famous silent movie star Norma Desmond (Gloria Swanson) and her loyal butler Max Von Mayerling (Erich von Stroheim). Desperate for work, he convinces the unhinged Norma to hire him as a script doctor on her dreadful screenplay about Salome. Joe ultimately moves in and Norma falls head over heels for the young scribe - a development sorely tested by Joe's affection for fellow aspiring writer Betty Schaefer (Nancy Olson). 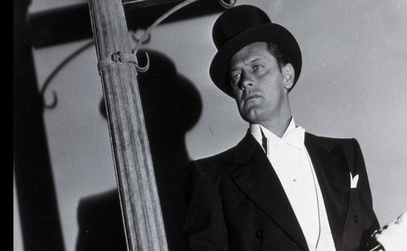 This performance marked Holden's first Oscar nomination. On his first Oscar nomination, Holden, still something of an industry up-and-comer at age 32, hadn't a real prayer of scoring victory in Best Actor - as expected, Ferrer, who three years earlier took home the Tony for his turn as Cyrano, emerged triumphant. Fun as Ferrer's scenery chewing is, however, there's no doubt which of these two turns has proven the more timeless. Holden, at his most matinee idol, is pitch-perfect in Billy Wilder's Sunset Boulevard - the worst thing you could say about him is Swanson is even more spellbinding. The remarkable thing is, Holden as Joe Gillis would have never come to fruition if it weren't for Montgomery Clift, initially cast in the role, bolting from his contract prior to filming. Who knows what Clift could've done with the part (no doubt, per usual, he would've aced it) but it's tough to fathom topping what Holden so magically pulls off in the picture. From the moment Holden's Joe first graces the screen, face down and dead in Norma's pool, he leaves an overwhelming impression. Though Swanson hogs the spotlight in scene after scene, Joe is our master of ceremonies all along, guiding us through the fascinating and demented world in which Norma lives. Holden has never looked more dashing, nor exuded so much irresistible charisma, but that's hardly to say he's a mere pretty boy. This is a rich, lived-in performance, a portrayal of a hopeless man just desperate enough to get himself involved with a strikingly unstable figure. Joe has no shortage of confident quips - he is, after all, a Hollywood screenwriter - but underneath the snappy dialogue is a palpably lost and conflicted man. The chemistry between Holden and Swanson is as sizzling as it is disquieting, even if Joe is never truly infatuated with Norma - that is, besides an infatuation with the idea of using her as a stepping stone to survive in Hollywood. Holden's rapport with Olson may not be a tenth as compelling as his scenes opposite Swanson but they do at least give the charmer a chance to show off his lighter side. Yet, it's the romance with Betty that of course proves Joe's ultimate downfall, as the increasingly unpredictable Norma sees herself in a tug of war with this young woman. Norma's reaching out to Betty proves the final straw for Joe, giving Holden the opportunity to at last dominate the screen himself as Joe candidly tells Norma the public has long forgotten her and no comeback has ever really been in the cards. Sunset Boulevard is very much a Gloria Swanson showcase through and through, the sort of comeback vehicle Norma Desmond could only dream of. Yet, the film wouldn't excel to such incredible heights without the right Joe. Holden is absolutely exemplary as he kicks off his emmaculate big screen run in the 1950s, staking his claim as one of the finest leading men of the decade. Brando portrays Terry Malloy, once an up-and-coming prize fighter but now a despondent dockworker, running errands for Johnny Friendly (Lee J. Cobb), the mob-connected boss of the dockers union. After unwittingly drawing a fellow dockworker into an ambush that leaves the man dead, Terry, ridden with guilt over the murder, becomes close to the victim's sister Edie (Eva Marie Saint). Much to the chagrin of Terry's mob-associated brother Charley (Rod Steiger), Edie and waterfront priest Father Barry (Karl Malden) encourage Terry to testify against Johnny. This performance marked Brando's fourth Oscar nomination and first win. When Brando lost the Best Actor prize in 1951 for A Streetcar Named Desire, Oscar night attendees, including winner Humphrey Bogart (for The African Queen) himself, were flabbergasted. The Brando loss prevented Streetcar from achieving the feat of sweeping all four acting categories - a tall order still not accomplished by any picture to this day. There were several factors behind the Brando loss, chief among them the fact that, by the early 1950s, Bogart was seen as due for Oscar victory, surely much more so than Brando, in merely his second appearance on the big screen (ditto Monty Clift, whose turn in A Place in the Sun marked only his fifth film role). No doubt playing a role too, however, was Brando's refusal to cozy up to members of the Academy - long before his infamous Sacheen Littlefeather stunt at the 1972 telecast, he early in his film career frowned upon the ceremony and the concept of such competition among actors for an award. In the 1954 Oscar season, however, Brando had a change of heart, albeit a short-lived one. He legitimately played the awards season game, providing a plethora of interviews to the right industry people and advocating on behalf of himself and his latest picture from director Elia Kazan, On the Waterfront. This time around, the competition wasn't as formidable - Bogart already had his Oscar, as did Crosby. O'Herlihy was a non-factor and all of the buzz around A Star Is Born was for its leading lady. The cake was baked for Brando as On the Waterfront all but swept on Oscar night, winning everything but Best Original Score and Best Supporting Actor, where there was some clear vote-splitting among the equally brilliant Cobb, Malden and Steiger. When Kazan later reflected in his memoirs on acting in film, he proclaimed Brando in On the Waterfront was the greatest of them all - even better than the actor's turn in Streetcar. Hyperbole? Not really. In both pictures but even more evocatively in On the Waterfront, Brando puts on a show that marks a startling break away from the more mannered acting styles of the leading men of decades prior (not to diminish the contributions of those terrific stars of the silver screen), to something more unaffected and unpredictable. Brando's tough, rugged exterior may have been a familiar sight but the fragile man underneath that seemingly sturdy skin, the anguished Terry Malloy, was decidedly unexpected. Take, for instance, the legendary taxi scene with Brando and Steiger, which has perhaps been revisited and replayed to the point of oversaturation. What makes it such a gut punch, beyond the exquisite dialogue, is a delicate fashion in which Brando in particular plays it. When Steiger's Charley passes his brother a gun, convinced he'll have no choice but to use it against Johnny and his goons, Terry gently brushes it aside with feelings of both vexation and unconditional love for Charley. Brando finds a way of consistently approaching the material in surprising ways, like the unforgettable glove moment in Terry's walk in the park with Edie and Terry's agonizing journey to confessing to Edie the tragic circumstances behind her brother's death - the more infatuated he becomes with Edie, the more repentant he feels about not being honest with her. To this day, the sight of Terry, nearly beaten to death by Johnny's thugs after confronting the boss over being the lone man not hired for recruitment, forcing himself to his wobbly feet to enter the dock, is a remarkable and stimulating piece of cinema, closing the proceedings on the most rousing of notes. Initially eyed for On the Waterfront was Frank Sinatra, who the year prior proved himself a plenty reliable actor with his Oscar winning turn in From Here to Eternity. Odds are, Sinatra would have made for a fine Terry Malloy but color me skeptical that he could instill this character with the same palpable sensitivity with which Brando portrays it. Brando lives and breathes this man and so vividly gets what makes him tick. In a storied career full of memorable performances, this is Brando's best. Streisand portrays Fanny Brice, the outrageously talented comedienne and singer who, toward the beginning of the twentieth century, is the toast of Broadway. Prior to stardom, however, Fanny is a bit player in New York City vaudeville. Hardly the typical beauty of show business, she nonetheless draws the attention of theater legend Florenz Ziegfeld (Walter Pidgeon), who gives Fanny her big break as a member of his iconic Ziegfeld Follies. While Fanny soars in fame, her relationship with the dashing gambler Nicky Arnstein (Omar Sharif) proves decidedly more haphazard. 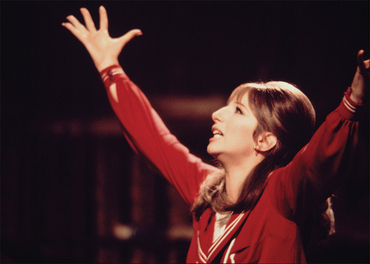 This performance marked Streisand's first Oscar nomination and win. The 1968 Oscar race in Best Actress was, to put it mildly, an entertaining ride. From the moment the film adaptation of Funny Girl was announced - to be directed by the beloved William Wyler, no less - Streisand was viewed as a shoo-in for Oscar glory, even though she didn't earn the Tony Award for the role. The race, however, proved exciting and unpredictable as both Hepburn and Woodward earned career-best raves for their turns and Neal graced the screen for the first time in three years, following a much-publicized series of strokes that kept her sidelined. The fifth nominee, Redgrave, was the clear underdog among this quintet, headlining a film negligibly embraced by critics nor audiences, but earned heaps of coverage with her vocal opposition to the Vietnam War. For some time, it appeared Woodward was well-positioned to score her second Oscar but then, to the detriment of her chances, she briefly boycotted the ceremony, not pleased to see husband Paul Newman fail to earn a nomination in Best Director for Rachel, Rachel. Newman ultimately persuaded Woodward to attend but the damage was done. Likewise, Neal hadn't planned to attend until Gregory Peck, then Academy president, convinced her to join the festivities. (Not that Neal, in a borderline-Supporting role, was ever viewed as a daunting threat for the win.) Hepburn, per usual, was never expected to go. On Oscar night, of course, that stunning tie came to fruition. Audience reaction to presenter Ingrid Bergman announcing Hepburn as the first winner was merely pleasant, while the subsequent naming of Streisand elicited a thunderous roar of applause. While voters may have been deadlocked, there was no question whose side ceremony attendees were on. And who can blame them? From the moment Streisand bursts onto the screen in Funny Girl, checking herself out in the mirror and greeting herself with the inimitable "hello, gorgeous," you know you're about to behold a true star-making performance. Funny Girl itself isn't a sublime piece of filmmaking, hardly among Wyler's best efforts, but it splendidly works as a showcase for its star and that's all that really matters here. Streisand is front and center, upstaging everything and everyone around her. It's the rare performance that would pitch-perfectly work on both the stage and screen. Streisand has smoldering chemistry with Sharif but while the romance is fine and dandy, I'm so much more taken with the star's comic genius. She is, time and time again, devastatingly funny in this picture, proving herself the most gifted of comediennes. And then there's the music, that glorious Jule Styne/Bob Merrill music, which Streisand devours and delivers in the most exquisite fashion. From "I'm the Greatest Star" and "People" to "Don't Rain on My Parade" and "My Man," Streisand slays at every turn. Streisand would go on to countless films (and albums, of course) over the decades to come but no performance yet has come close to matching what she pulls off in Funny Girl. It's a glorious turn. Goldberg portrays Celie Johnson, an African-American woman grappling with life in rural Georgia over the first half of the 20th century. At age 14, Celie is raped and impregnated by her father (Adolph Caesar), who forces her into a marriage with the abusive "Mister" Albert (Danny Glover). Celie spends all too much of her adulthood subjected to Albert's violence, on top of the rampant racism of the south. Events, however, like the entrance of the vivacious and headstrong Shug Avery (Margaret Avery) give Celie reason to keep on going. This performance marked Goldberg's first Oscar nomination. When presenter F. Murray Abraham took to the stage at the 1985 Oscar ceremony and, upon opening the envelope for Best Actress, proclaimed the winner was, in his estimation, the "greatest actress in the English language," odds are Goldberg knew she was doomed. The champion would indeed be Page, at last emerging triumphant on her eighth Oscar nomination. Goldberg - and the rest of the audience - erupted with grand enthusiasm at the Page victory but the comedian and first-time actress must felt at least a little sorrow as well, not necessarily at her own loss but now knowing her film, nominated for 11 Oscars, was destined for a complete shutout. Goldberg was The Color Purple's best, perhaps only shot at a win on the big night. Steven Spielberg's picture was a polarizing effort to say the least and the filmmaker's snub in Best Director all but took it out of contention for the top prize. With Out of Africa soaring, only The Color Purple's leading lady - who would have marked the first African-American to earn the Best Actress Oscar - seemed to have a real prayer. 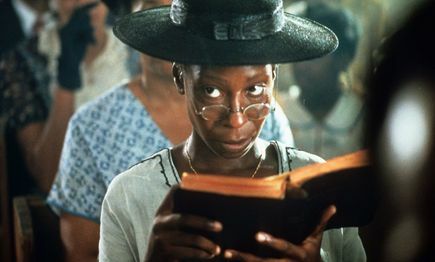 Goldberg in The Color Purple is the best performance of any Spielberg-directed picture, a riveting master class in acting from someone who somehow hadn't graced the big screen before. Celie's suppressed rage toward Albert and the world around her proves as suffocating for us as it does the character - and when she at last stands up to her nefarious husband, we want to leap out of our seats for a standing ovation. Likewise, Goldberg leaves us devastated as Celie discovers the countless letters from her sister that Albert had for years kept for her. And the tears flow harder than ever at the film's glorious conclusion ("Nettie!"). The Color Purple is a marvelous ensemble piece, as Spielberg draws career-best turns out of Glover, Avery and the startling Oprah Winfrey (also making her film debut), but Goldberg is the heart and soul of the proceedings. Without the right Celie, the production would flounder. Goldberg, however, proves simply sublime. It's a brave, absorbing portrayal of a woman who lifts herself up from submissiveness to extraordinary strength in the most impossible of environments. Spielberg's adaptation may hardly be perfect but there's no denying the greatness of Goldberg's turn.